Get a better night's rest for you and baby. The first question people usually ask when they meet your newborn is, "What's his name?" And then, in the next breath, without fail, it's, "Is he sleeping through the night yet?" You may start immediately thinking, "Should he be sleeping through the night already?" And then, in your sleep-deprived, new parenting panic, you'll tend to go straight to, "What am I doing wrong?" I am convinced that part of why we are so exhausted as new parents is because we are in a constant state of not knowing, second guessing, and troubleshooting. So for all of you new parents or soon-to-be parents, here are some tips to help curb anxiety about your newborn's sleep habits. 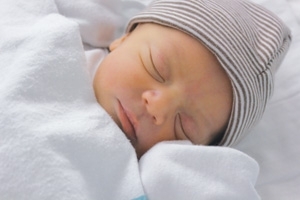 Should your newborn baby be sleeping through the night? Nope. Your newborn will not be sleeping through the night at first. Usually from birth until around six to eight weeks, your baby's sleep has no patterns, rhyme, or reason. You may also notice some day and night confusion. Biological sleep rhythms just don't exist at this young age. At this point, do whatever it takes to get your baby to sleep. Don't worry about creating bad sleeping habits. Rock baby, put him in swings, nurse him to sleep, do whatever works. Your little peanut is too biologically immature to pick up on any bad habits. Your goal is to keep baby as rested as possible and do what works to promote sleep. Keep in mind that even an hour can be a long time for newborns to stay awake. Watch for sleepy cues (like rubbing eyes) beginning around 45 minutes of being awake, and get baby back to sleep before he becomes overtired and cranky. It's exhausting business being a newborn. Around six to eight weeks of age, glorious things start to happen. You'll start to notice your baby really smiling at you. Not gassy smiles, but genuine, heart-melting smiles. The late afternoon/ evening fussiness will peak. Day and night confusion ends. Manipulate light to help your baby distinguish between day and night; incorporate bright lights and sunshine during the day, and keep a dim house at night. The longest single sleep period will start to occur at night. It's usually a four- to six-hour stretch starting later in the evening, with bedtime beginning between 8pm and 10pm. With this "long" stretch of sleep, you may even start to boast that your baby is sleeping through the night! These well-defined periods of sleep at night and your baby flashing that adorable toothless grin demonstrate that he can now make connections and follow cues. At six to eight weeks, we can begin establishing a healthy foundation for sleep. You'll want to provide a consistent place for your baby to sleep. This is a great time to introduce the crib. Use swings, strollers, and car rides less and less to promote sleep. Now that your baby can pick up on cues, these sleep props will become the expectation. Along with a consistent sleeping spot, you'll want to create a soothing routine; this is a nice way to help your little one figure out that it's time to go to sleep. The brief routine can include rocking, nursing, or singing. At this age, you don't have to put baby down awake, but you can begin to dabble with self-soothing. Try putting him down drowsy but awake, and see what happens. Give him a minute (no need to do more at this age) to see if he can fall asleep on his own. If he falls asleep, great! This is a sign that you got him down before he became overtired. If he starts crying or has trouble falling asleep, pick him up. Babies this age sleep many times throughout the day, so you'll have plenty of opportunity to practice the art of timing and self-soothing. Establishing healthy sleep habits now will position your baby leaps and bounds ahead of the game and can help prevent future sleep challenges. Becky Roosevelt is a Family Sleep Institute certified child sleep consultant, founder of Snug as a Bug Pediatric Sleep Consulting, and the Operations Manager/Assistant Instructor at the Family Sleep Institute. Becky works with families nationwide to help parents get their children the sleep they need. Through her work experience and as a mom, Becky knows firsthand the importance sleep plays in a child's well-being, behavior, mood, and development.